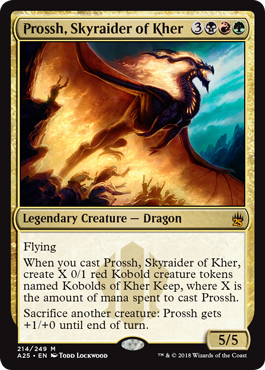 Originally printed as part of the Commander 2013 set (same year as Oloro, Darevi and others), Prossh is getting reprinted in Masters 25, along with Animar who was from the original Commander product Wizards released. Animar isn’t a bad looking commander either, but Prossh interested me immediately. I set about doing some research on him, and it turns out that he’s not very expensive to buy right now, but he is a tier 1.5 general. It seems that there are differing ways to build him, usually focusing on the fact that he creates tokens on cast trigger, and abusing those tokens either with things like Doubling Season (to make more tokens) or sacrificing them to give him additional power and making a semi-voltron style build. He’s also been abused by combo players, and I feel like a mix of these themes should be present in the deck. Because he costs 6 mana to cast, we want to ramp fast and ramp hard — thankfully we’re in a good color combo to do so. The big combo we want to work towards in this deck is a combination of Prossh and the enchantment Food Chain. Food Chain doesn’t look like that great of a card on the surface, but it works well with Prossh’s abilities. So when Prossh enters the battlefield, he creates X 0/1 Kobolds based on the amount of mana used to pay for Prossh. This is one of the few commanders that actually benefits from commander tax, as each time you cast him, you’ll have to pay two extra mana to do so, which in turn means two more Kobolds will be spawned. Food Chain is a sacrifice outlet, and gives you mana equal to the sacrificed creature’s CMC + 1. Since your Kobolds are tokens and have effectively 0 CMC, they still net 1 mana per sacrificed creature. This means if you cast Prossh and get 6 tokens, you can sacrifice two of them, then sacrifice Prossh to Food Chain netting you enough mana to recast him and start the process over, effectively giving you infinite mana and infinite tokens. That won’t win you the game by itself, but it’s the cornerstone for this deck. From there you can use additional cards like Purphoros to kill your opponents with the ETB damage triggers from Prossh’s tokens, use Ogre Battledriver, Beastmater Ascension or Craterhoof Behemoth to buff them up and swing for the kill. Alternatively, you can sac those creatures to buff up Prossh himself and apply something like Tainted Strike to kill someone off with infect. The possibilities are varied. One drawback to Prossh and his token generation engine is the lack of haste. We have that covered with cards like Anger and Fires of Yavimaya. I’ve added some recursion in case Food Chain gets nuked, along with some cards that will benefit from the sacrificing you’ll be doing. You can draw cards and force your opponents to sacrifice their creatures if you have Fecundity, Dictate of Erebos and Grave Pact on the board. If you ramp fast enough, you’ll be able to get the Food Chain combo going quickly and you should be able to tutor up an additional win-con by then too. Some of these other tools will help you control the board if you happen to have a slower game. Overall I think this deck will be a lot of fun, and will likely be one of my next builds after the Masters set releases. You can check out my full decklist here.